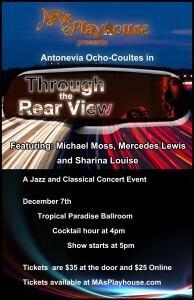 On Sunday December 7th at 4pm, come ride shot gun into the past and into the many iterations of love. Through the Rear-view will ring in your December with warmth and nostalgia for that wholesome yet elusive stranger called love. The evening with Jazz and Classical inspirations dedicated to looking back and moving forward in truth. The honesty and the passion will move you beyond your seats and transport you to your favorite moments of love. Tickets can be purchased at out ticketing site: Brown Paper tickets.